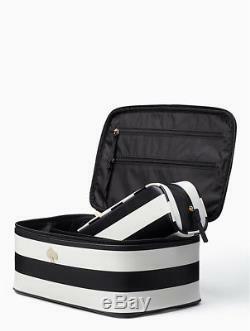 KATE SPADE COBBLESTONE PARK LARGE COLIN CREAM & BLACK STRIPE TRAIN CASE COSMETIC CASE SET. Brand new Kate Spade Cobblestone Park Large Colin Cream & Black Stripe Train Case Cosmetic Case Set with tags. Brand new Cosmetic Case Style # WLRU5089. Cobblestone Park Large Colin Train Case Cosmetic Case Set in Cream & Black Stripe with matching leather trim. This Set includes a large Train Case Cosmetic Case and a small Travel Cosmetic Case. Each Case is constructed of smooth vinyl with matching leather trim. Each Case has the signature 14K Yellow Gold-Dipped Hardware. Each Case has a Kate Spade signature, logo and golden spade. The Train Case measures 11 inches wide x 6 inches high x 7 inches deep. Dual zippers at the top collar open from the center to the back wall hinge. The lid has a top handle with a raised area to accommodate the fingers. The Interior of the lid has 2 pockets for small items. The Interior is lined with a custom Capital Kate jacquard wipeable fabric lining. The base is divided into 2 large sections. The small Travel Case arrives inside the base. The base has an open slip pocket. The exterior features a Golden Spade Charm engraved with a Kate Spade signature. The Travel Case measures 11 inches wide x 3.5 inches high x 3.5 inches deep. The Top Zipper opens from the left side to the right. The Interior is lined with a wipeable lining. An open slide pocket is on the Interior back wall. Both Cosmetic Cases are attractive in a Cream & Black Stripe. Each Cosmetic Case has a generous and spacious interior. All surfaces are wipeable for convenience and easy care. This wonderful Cosmetic Case Set has 2 Cosmetic Cases to meet all of your storage needs in an attractive design. The item "KATE SPADE COBBLESTONE PARK CREAM & BLACK STRIPE TRAIN CASE COSMETIC CASE SET" is in sale since Wednesday, December 26, 2018. This item is in the category "Health & Beauty\Makeup\Makeup Bags & Cases". The seller is "returntocalifornia" and is located in Gibsonia, Pennsylvania. This item can be shipped worldwide.